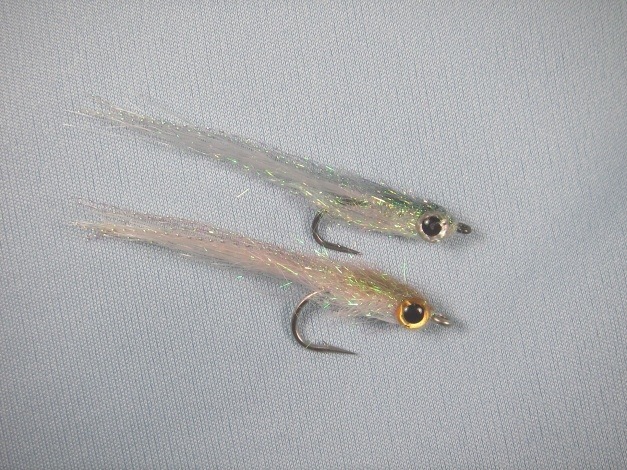 Smartt’s Glass Minnow is a small iridescent baitfish pattern. 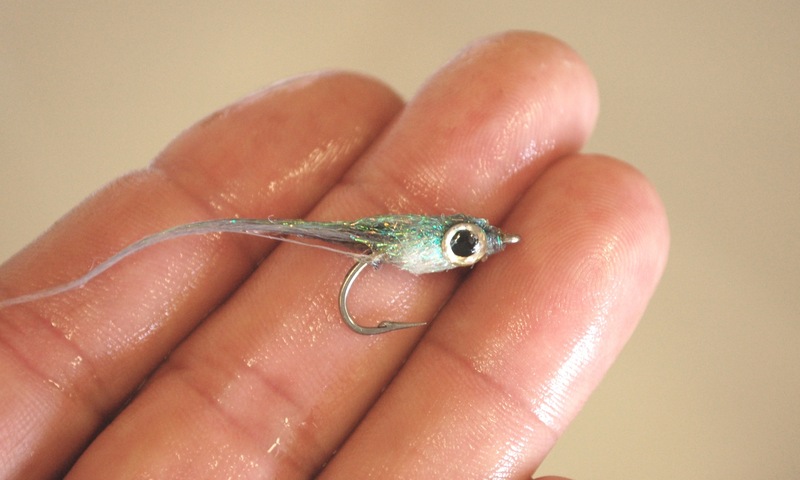 It is effective when gamefish are targeting small minnows like shad fry, glass minnows, or bay anchovies. It works well on both saltwater and freshwater species. Good video. It’s not as easy to tie as you make it look. Actually, I put a healthy drop of Aleene’s on the back of the eye to glue them on. When you press the eyes onto the fly, the Aleene’s slowly saturates the fibers down to the hook shank and keeps the eyes tightly secured. I don’t put any Aleene’s “over” the head, although you could do that if you wanted to make the head tougher. 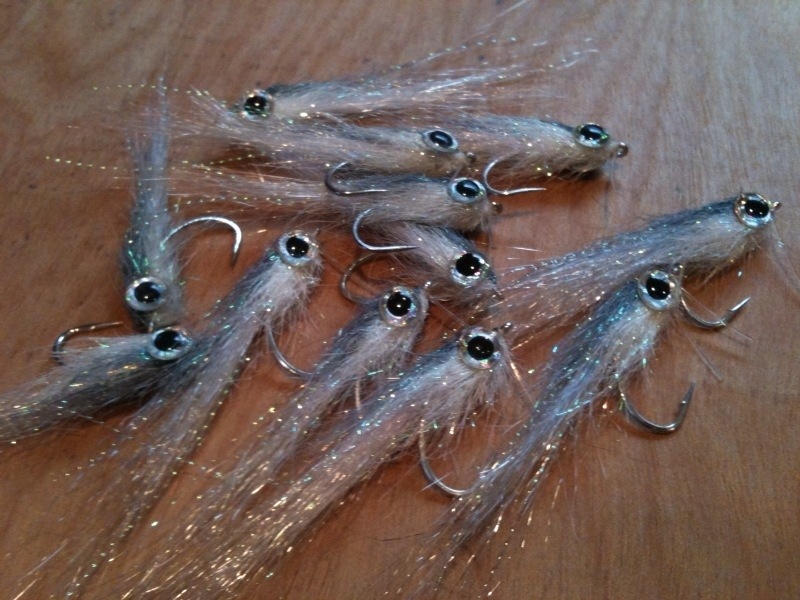 I have to tell you that this fly has become my all-time favorite fly fresh or saltwater. I first came to know it through a youtube video where you were nailing stripers one cast after another and listed the fly as the glass minnow. I came to the site and found out how to tie it, and I’ve been playing with variations ever since. It is just so simple, so easy to tie, that it’s just plain genius. My favorite variation right now is a craft fur tail with a few strands of crystal flash and several fibers of bucktail to prevent the CF from fouling. Dubbing loop to spin the ice dub head, Goop for the eyes. This has caught me spanish macks, jacks, ladyfish, snook, herring, bluefish, stripers, hybrid striped bass, white bass, largemouth, smallmouth, and more species. It just doesn’t stop producing. So easy, so realistic, yet so much movement! Easy to modify if you have specific needs (for bluefish I sometimes use tougher synthetic tails like SF blend and only dub halfway up shank). Anyway, thanks for a great pattern! Hello Tim, thanks for the note. Glad to her you are having such great luck with the Glass Minnow. I too catch a lot of fish on that fly. I appreciate your tips on different versions of the fly for various fish/actions. Send some pics! Have you ever tried using epoxy on the head to make it more bite resistant? I love the pattern nonetheless. I have not used epoxy, but have used Aleene’s Fabric Fusion on the head of the Glass Minnow to beef it up and encapsulate the eyes. It worked well. AFF doesn’t add much weight so it did not affect the action too much. The Ice Dub material is extremely fine and shredded. I twist it straight to the thread (no loop). Add a few extra winds to the head to add some bulk. Pick out with Velcro like you find on a ball cap or computer cable strap. I’ll try to get up a quick video. Using the loop will probably prove to make a more durable fly. You also can lay down a thin bead of Aleene’s Fabric Fusion over the hook shank and wrap over it. Just make sure you don’t smear it into the fibers as you wrap and pick. I don’t use any wax on the thread. Good luck with those stripers and albies! Send some pics if you can, I would love to see them. Love the fly! Do you fish this fly on a sink tip line or floating? Glad you like the fly! I usually fish it on a floating line, occasionally intermediate line, with a long fluoro leader and loop knot to fly. Normally fishing it in top 4 feet of water column.